While installing WhatsApp for the first time, if your WhatsApp is Stuck at Initializing, it could possibly be because of lot of contacts on your phone. I faced this problem on HTC Desire 500 and also on Samsung Galaxy S2. Before trying this, please back up your ‘Contact Details’ and if you had installed WhatsApp earlier, then please back up your WhatsApp text, media files and then try this. Solution is given as is, and I’m not responsible if you loose any data. If WhatsApp is not responding, ‘Uninstall WhatsApp’. Go-to ‘Settings’ of your phone and ‘Turn off Sync’ option. This too will vary and be different for different phones and different versions of Android you are running. On my HTC, I had the option to turn off Auto Sync. 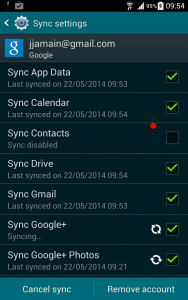 On Samsung Galaxy S2, I could just turn off all Sync options. 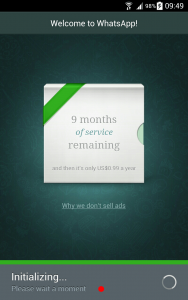 Install WhatsApp again, and then try Initializing it again. It should work. You can turn your Sync options again. Great post. I was checking continuously this blog and I’m impressed! Very helpful info specifically the last part 🙂 I care for such info a lot. I was seeking this particular info for a long time. Thank you and good luck.